This post is in the area of Family Law, addressing the situation when a military member earning a retirement becomes divorced and required by the court to divide their future retirement asset with a non-military spouse. This post addresses details that you would think do not need explicit attention. 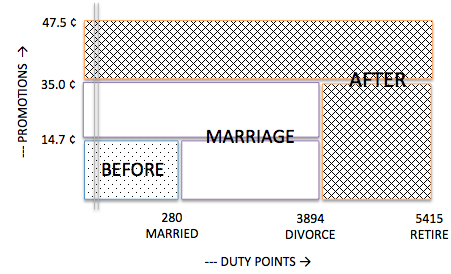 After all, how hard is it to give a spouse “50% of what was earned during a marriage”? 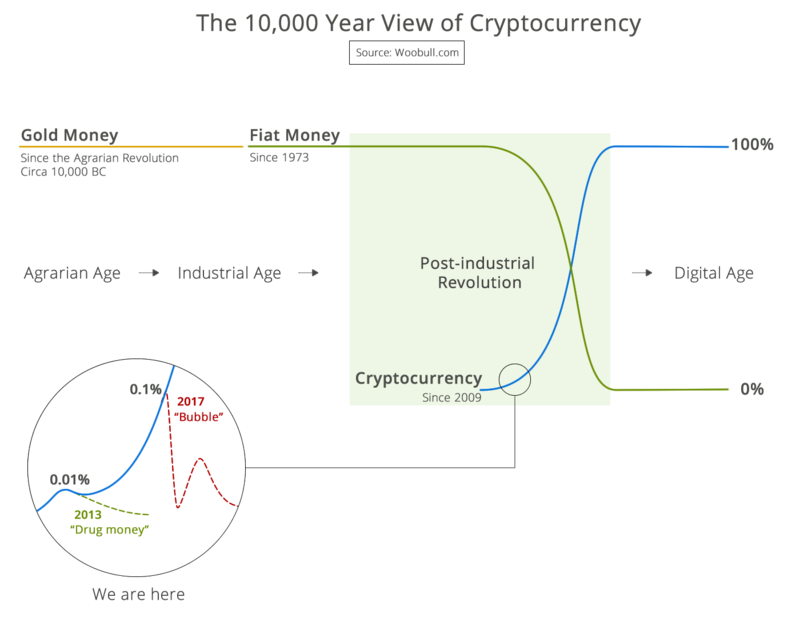 However, when $100,000 to $1,000,000 is on the table, a lot of time and money is spent arguing about that simple phrase. Just to get you thinking about the strange nature of military retirements, consider that military retirement income is the only place where the same exact dollar has legal status as an asset (allowing an ex-spouse to have half of it) and simultaneously cash flow income (so the IRS can tax it). Stopping confusion, promoting knowledge, and providing a simple answer for members, attorneys, and courts is the point of this post. In a prior blog post regarding division of reserve military retirement, and web pages specializing in any military or reserve military retirements, or promotion enhancements, you can download material suitable for learning, and mediation activities, court proceedings. You can also learn about a 2011 New Jersey case study demonstrating how courts struggle with these issues. The Defense Finance and Accounting Service (DFAS) requires a court order either name a dollar amount to send to the spouse, or name a percentage to send to the spouse. Contrary to what Mark Sullivan publishes, you do not have to pick one of the examples DFAS gives in their example document–those are just examples. Any formula or method that allows them to calculate a percentage after retirement fits the “percentage category”. This blog post considers two possible formulas necessary to calculate a percentage for DFAS based on “50% of what was earned during the marriage”. 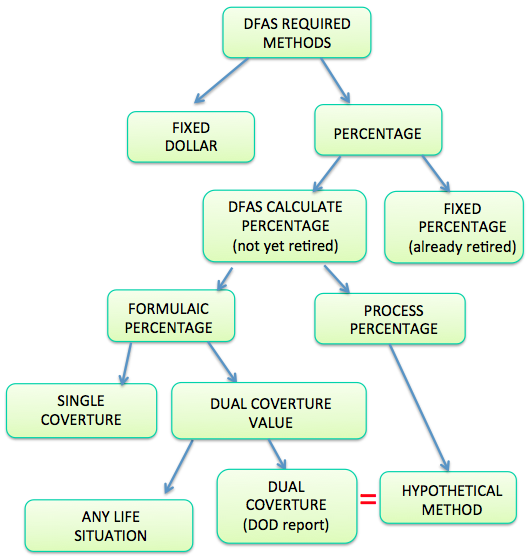 There are only two ways to create the DFAS percentage which properly divide enhancements for promotions, longevity, and duty during only the period of marriage: The Dual Coverture Value (DCV) method (or Dual Coverture method in simpler cases) and the Hypothetical Method. Using a visual representation of an area diagram, DCV is a simple way of calculating coverture fraction discovered and published by Brian Mork, Ph.D. The Hypothetical Method is a more complicated process (sequence of steps) published by DFAS. The two methods yield identical mathematical percentages to send to DFAS if you stipulate that military pay raises equal Cost Of Living (COLA) annual raises. This is shown with algebra symbolic formulas and examples in a pdf memorandum downloadable from a prior blog entry or a matching static web page. Dual Coverture much more simply accommodates military members who joined the service after 9/8/80 (see below). The Hypothetical Method requires extra hand-calculations by the attorneys, prone to dispute, litigation, and error. Dual Coverture equitably adjusts payments to both spouses with the same time value of money, using military pay charts. Specifically, while both parties wait until retirement to receive monies, the Hypothetical method gives “time value of money” to the military members in the form of military pay increases, while the ex-spouse gets “time value of money” in the form of national COLA rates. Unless you’re trying to be inequitable, there is no reason to treat the parties differently. For military members who began Sept 8, 1980 or after, the increases for the first year are reduced 1%. It would be inequitable to base the military member’s retirement this way, but use the hypothetical calculation for the ex-spouse base without the 1% reduction. Whether it comes to “time value of money” or 1-time Federally mandated reductions, why not treat both people the same? The Dual Coverture Value method is capable of dividing duty and promotion enhancements during the precise marriage window, setting aside duty, promotion, and longevitiy enhancements earned both after and before the marriage. The Hypothetical Method can only set aside duty and promotions earned after the marriage. The Dual Coverture Value method can do division when there is more than one ex-spouse. Hypothetical cannot. Regarding #2 above, for service members who began before Sept 8, 1980, their retirement is based on the final highest monthly salary level, and the pay chart lookup is easy. However for military members who began Sept 8, 1980 or after, retirement is based on the average of 36-months’ salary level (see 10 USC 1407 vs. 10 USC 1406). DFAS will not calculate the “high 36” value for a Hypothetical Method award, and requires this number be submitted for a valid asset division order to be accepted by DFAS (DFAS Instructions to Attorneys (or local copy), pg 9, top paragraph – this was updated in 2012, see References section). Individual parties are left with the task if they choose to do the Hypothetical Method. With the Dual Coverture Value method there is no need to name the 36-month average in the order. DFAS already does the 36-month average at the time of payment as part of the normal retirement calculation, and simply applies the fraction submitted with the order. COLA and 36-month averaging are “automatically built in” for both spouses. Whether you are a client or an attorney, feel free to contact me if I can help you. I will help you with your personal numbers if you wish. If you pursue simplicity and equity and all parties understand the military pay system before approaching the court, you’ll find that your legal work is a lot less painful. This entry was posted in Finance and tagged coverture method, division of reserve military retirement, divorce, dual coverture, reserve military retirement, USFSPA. Bookmark the permalink.